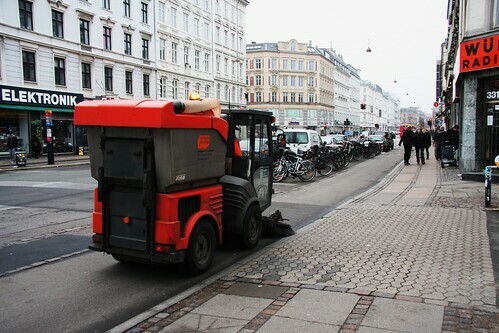 While average citizens on normal bikes who cycle to work or school have no need for useless equipment it is, however, rather vital that the city in which they live is well-equipped for bicycle culture. It's kind of like the mainstream bicycle culture version of the Keirin. 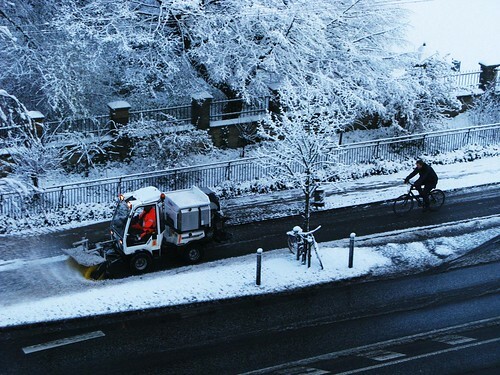 After a massive snowfall the bike lane snowploughs push the snow off to the left and the street snowploughs push their snow to the right, leaving mountains of snow drifts in between. A nice natural separated bike lane, in a way. In this case, small bulldozers move out and shovel the snow into dumptrucks, which promptly take the snow and dump it into the harbour. We've had pretty steady snowfall this winter, but no big dumps as yet. The rest of Europe has been hit a lot harder. Me and the kids are itching for 50 cm or more so we can get sledding.